The number one annual for football fans everywhere! From the makers of the UK's best football magazine! MATCH is the UK's bestselling football annual and is top of Christmas wishlists for footy fans everywhere. 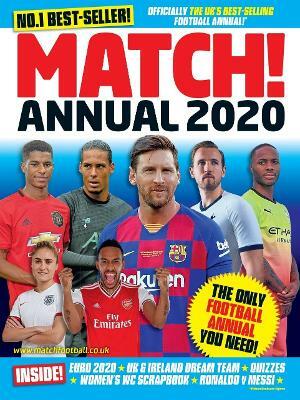 Inside the Match Annual 2020, you can build your Ultimate Player, check out the wonderkids who'll rip up 2020 and find out everything you need to know about Messi, Ronaldo, Kane, Salah, Mbappe, Lewandowski, Cavani, Icardi and Sessegnon! Plus, it's packed with football world records, legendary Prem No.10s, epic fashion fails, brain-busting quizzes, FIFA's best team ever, bonkers pics, footy stars emojis, cool cartoons and loads more! Don't miss it! MATCH is the best football magazine in the UK - it's packed with big stars, red-hot gear, transfer gossip, FIFA tips, epic stats, massive interviews, awesome previews, tough quizzes and loads more every week. It's the magazine all football stars want to be in, and all football fans want to read.